They were right in front of me, behind the glass door. It was the only thing separating me from 100 persons. They were of all ages: children, adults, old people. Some must have had my age, they could have been me, a friend of mine or a university classmate. Differently from me though, they were on the other side of the glass door. And they were all looking at me. As soon as I opened the glass door, the voices of the asylum seekers started to speak loudly. I took a step forward and I went outside, leaving the glass door behind me. I was now standing right in front of the asylum seekers: there was no door, no glass to isolate me anymore from the real world. If I go back with my thoughts to two years ago, right when the EU-Turkey Deal started to be applied, the first thing that comes to my mind is the speed with which everything changed. In less than 24 hours nothing was as it was before. The Deal claims that all the people arriving illegally in Greece from the 20th of March 2016 and on will be sent back to Turkey. Moreover, for every Syrian that gets sent back to Turkey, another Syrian will be resettled in a EU country. It was like a jumping spring: after pressuring it too much, it started jumping out of control. 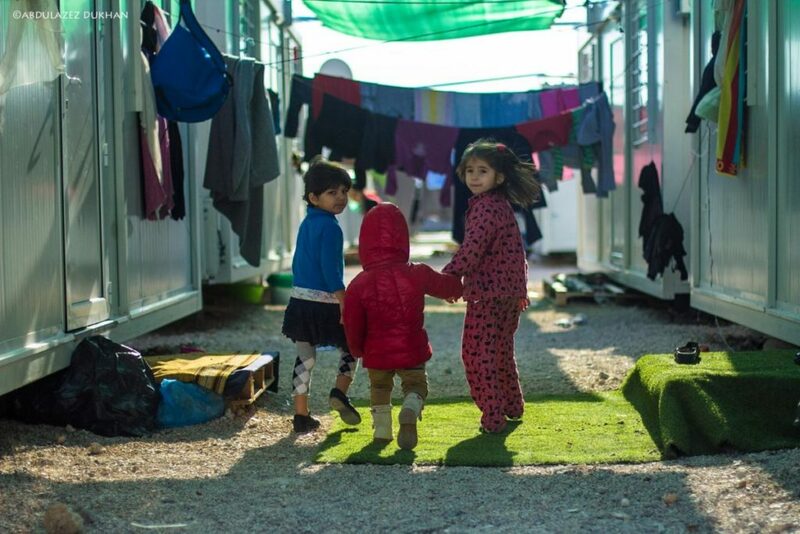 Thousands of people living already under very tough conditions in Greece were afraid to be sent back to Turkey: they were “guilty” of having reached Greece illegally, as if they had other viable options. I will never forget the tears, the prayers and the threats of the asylum seekers in those days. The determination in the gaze of those who have lost everything and don’t want to lose anything more, marked, however, by the impossibility to keep themselves and their families safe and independent. After being left in the mercy of the sea, they were now being hurled from one place to another, by a system that did not truly want to help them. In the same way, I will never forget the consequences of the Deal on me as well, a young intern at that time. I was managing hundreds of persons at once, while having the ability to help only a very limited number of them. The objective? To facilitate the application for international protection from our offices, using the very slow system provided by the Asylum Service. The toughest part for me was being aware that my choice could lead to the detention or deportation of those I said “no” to. In order to be trusted, I had to be determined and coherent with myself: I did not have the luxury to change my mind or behave differently because this would have lost me my credibility. Inside me, however, where nobody but me could see, the stomach pain, the tiredness and the anguish wanted me to break in tears, but my mind suggested not to. The Deal changed the life of thousands of asylum seekers back then and is still doing so now as we speak. Two years later, in fact, thousands of asylum seekers are struggling for a basic life in the country. The Deal drastically reduced the number of new arrivals in Greece, but it did not lead to better living conditions for those that still remain in the islands. Hotspots are overcrowded with asylum seekers that are not allowed to move anymore to the mainland. So people are just left there -some even since the 20th of March 2016- without information, basic living, healthy and hygienic conditions. They have thousands of questions but no answers. As I always say, there is an important lesson that I learnt from the Deal. In those days I realised even more that decisions can change the lives of the people affected by them. The political reasons that lead to short term decisions are considered more relevant than the consequences of those policies, which have serious effect on persons. In this case, the consequences affected the people who were fleeing wars or were escaping from very difficult conditions, only trying to start a normal life in Europe. The system obliged me, indirectly, to take decisions that should not have been mine to take, and carry very big responsibilities that should not be mine to carry. I will never forget those days and those nights with my eyes wide opened. The consequences of the Deal have been leading to unmanageable situations and complete lack of human rights. And again, decisions are being taken until now without paying attention to the consequences. Many times, the main concern of the authorities is how to send asylum seekers back to Turkey or their country of origin, whereas the basic issue should be the fact that people living in the hotspots today might become EU citizens in the future. On the other hand, authorities affirm that there are people who “deserve” to stay legally in Europe because they will be granted international protection. Leaving aside the meaning of “deserve”, how is it possible to trust an institution that did not even allow you to have decent basic living conditions until the moment it decided you “deserve” protection? How can you believe in a system that expect you to live in that way until it realises you have no other option but to stay in Europe? How would you be willing to collaborate for a better future in that society after all this? It feels as if I’m behind the glass door again: two years later the EU-Turkey Deal keeps going on, but we haven’t learnt enough, yet.